The Office of the Controller of Examination is preparing to publish the re-totaling results of those students who were not satisfied with their marks in this year’s School Leaving Certificate examination. The re-totalling results are likely to be published by the end of this month. 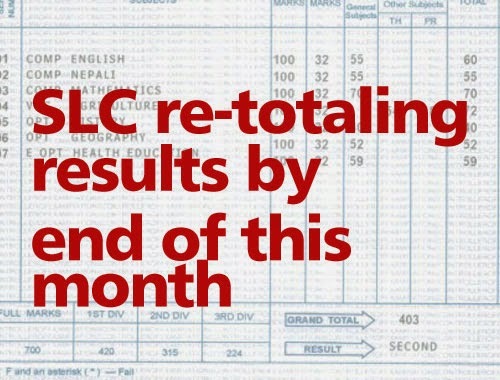 The SLC results were published on June 13. “Around 13,000 students have applied for re-totaling,” said Bishnu Bahadur Dware, Examination Controller, OCE. “We want to publish the revaluation results before the chance exams, which are scheduled for August 5-12 so that those who fail to make it through even after re-totalling can sit for exams.” Students who have failed in maximum two subjects can sit for chance exams. The application for re-totaling was opened from June 15 till June 29. Around 13,000 students applied for re-totaling from the OCE’s Sanothimi office during this period. The number of applicants may go up after the re-totalling forms are collected from across the country, the OCE said. Students applying for revaluation will get a copy of their answer sheets after the re-totaling results are published. A total of 548,248 students had appeared in the SLC, of which, only 173,436 (43.92 per cent) passed the exams.